The Jungle Gym Playhouses are playhouses built just for kids. From the Wendy house-sized Jungle Playhouse upwards, the playhouses get progressively larger and increasingly elaborate, allowing you to choose the perfect house for your child and their needs. The Crazy Playhouse is much chunkier than the Jungle Playhouse and has more headroom, suitable for children of reception and infant school age. It’s Swiss chalet style design is very attractive. 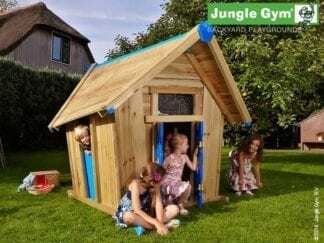 Both the Jungle and the Crazy wooden outdoor playhouses are available either on their own or as part of a climbing frame. 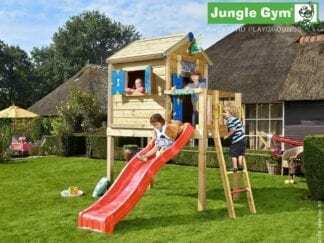 These models are called the Jungle Playhouse Large and the Crazy Playhouse XL and combine the fun of a playhouse with the additional enjoyment of it being on stilts! Watch as your kids climb up to their mountain hideout or lofty treetop canopy to survey their glorious kingdom. Both the Jungle Playhouse Large and the Crazy Playhouse XL come with a slide to make for an easy escape route. In addition, these there is also the Jungle Playhouse XL which is the crème de la crème of the playhouse world. Incorporating playhouse, climbing frame, balcony and slide there is plenty of space to play on these playhouses for kids. Watch with wonder as your kids play ‘house’ in the wonderful wooden playhouses. Guaranteed for 2 years and with free delivery, any one of these magnificent playhouses could be yours to entertain your kids all year long. Finance packages are available on all Jungle Gym combinations so please contact us if you require assistance and we will advise you how to apply.